This cranberry chutney homemade solid lotion bar recipe makes a wonderful last minute DIY stocking stuffer or homemade Christmas gift! These homemade solid lotion bars are both quick and easy to make and they’re ready to go within hours of making them. In addition, they’re also a snap to make in bulk for holiday party favors or gift giving in large groups. Your gift recipient(s) will love all the benefits of this cranberry chutney homemade solid lotion bar recipe. Benefits include not only the wonderfully sweet and tart scent of the cranberry fragrance but also the moisturizing benefits of the cocoa and mango butters and the anti-bacterial, anti-inflammatory and anti-oxidant qualities of Manuka honey! Plus, the eco-friendly packaging – that works like a push up pop – lends convenience and less mess while the printable cranberry labels lend a personal touch. Using a digital scale, begin by weighing out the beeswax, cocoa and mango butters. Heat until melted in a double boiler or at 50% power in the microwave in large glass Pyrex measuring cup. Remove from heat. Now carefully pour the combined, now liquid lotion ingredients, into your containers. (I used the 1.5 oz. 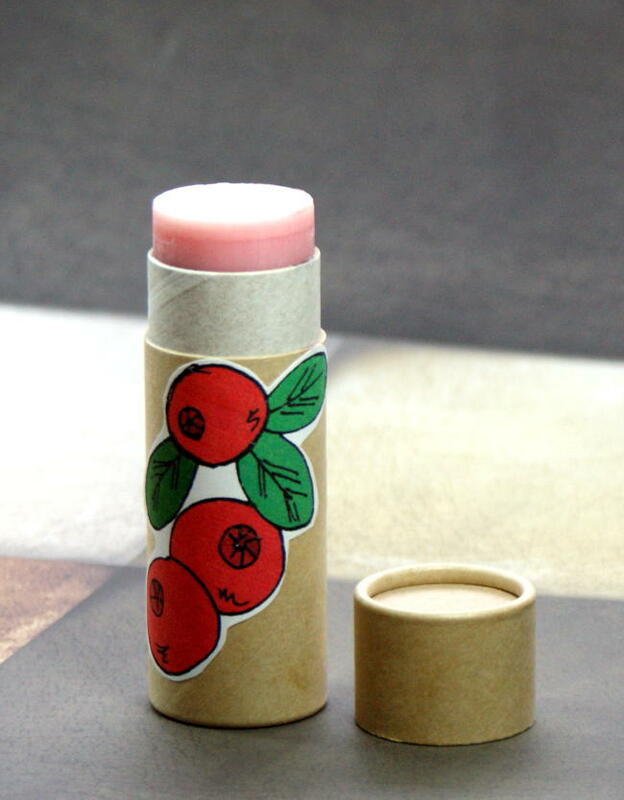 brown paperboard push up tubes from SKS Bottle & Packaging.) 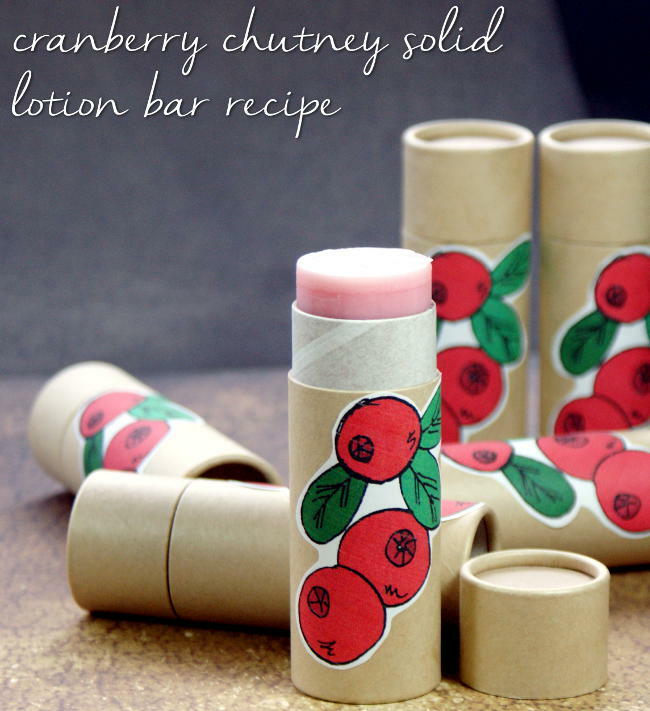 This cranberry chutney homemade solid lotion bar recipe will make six of these 1.5 oz. containers. However, if you don’t need six solid lotion bars, you can simply cut this homemade solid lotion bar recipe in half. Once your cranberry chutney solid lotion bars have completely solidified, you can cap the containers and add the cranberry stickers. (Click here to download my printable cranberry stickers I created for you.) Once you download the PDF file, print as many pages as desired onto full sheet labels. (I use the labels from WorldLabel as they have a great product in addition to great prices.) 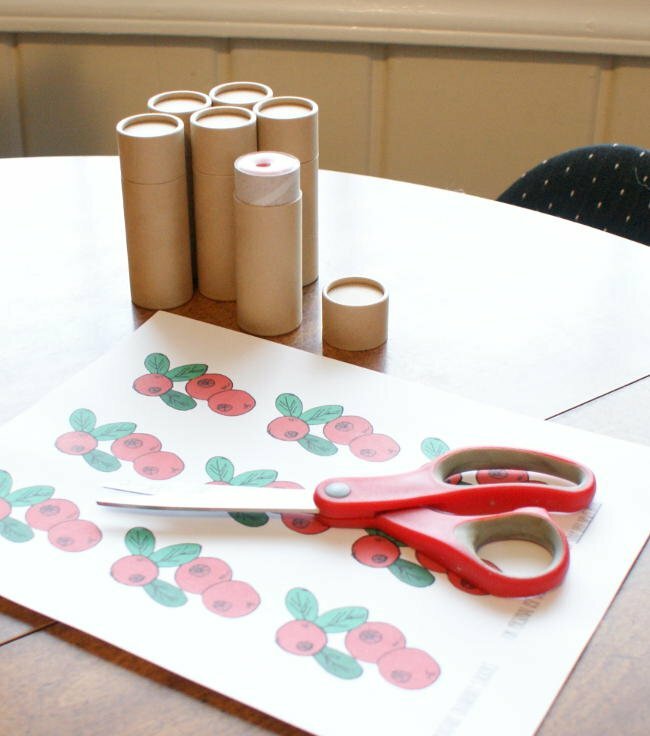 Then simply cut out the cranberry stickers and apply to your containers as desired. Interested in even more homemade cranberry themed recipes? Then you may also like my homemade cranberry body butter recipe as well as my frosted cranberry coconut milk soap recipe. Other homemade Christmas gift ideas you may like include my collection of non-greasy body butter recipes for making your own homemade lavender body butter, vanilla & fig body butter, lemon verbena body butter and cinnamon sugar body butter with free printable labels. For even more of my homemade bath and body recipes as well as favorites from around the web, be sure to check out and follow my DIY Bath and Body board on Pinterest. If you’re looking for additional homemade Christmas gift ideas, you’ll find an inspiring collection of DIY projects and recipes via my Christmas gift idea boards on Pinterest – Unique DIY Christmas Gift Ideas and DIY Stocking Stuffer Sized Christmas Gifts. You can also find and follow me via Blog Lovin’ and Tumblr, Facebook, Twitter, G+ and Instagram. I love lotion bars and those look adorable in your cute new packaging! Thanks! I’m so happy to know others enjoy my projects! You’ll want to pour it as cool as possible yet while it’s still liquid and stir well between each pour.